Following our post on measuring the success of offline marketing campaigns (print, direct mail, vehicle wraps, event sponsorship etc. ): here’s the second part of this series on measuring metrics. This time, how to measure the success of your online marketing activities and metrics. When a prospect, lead or customer hits your website you’ll want to know whether they’re engaging with your site and converting into sales. Visitors: This is the number of visits to your website in a given time period. 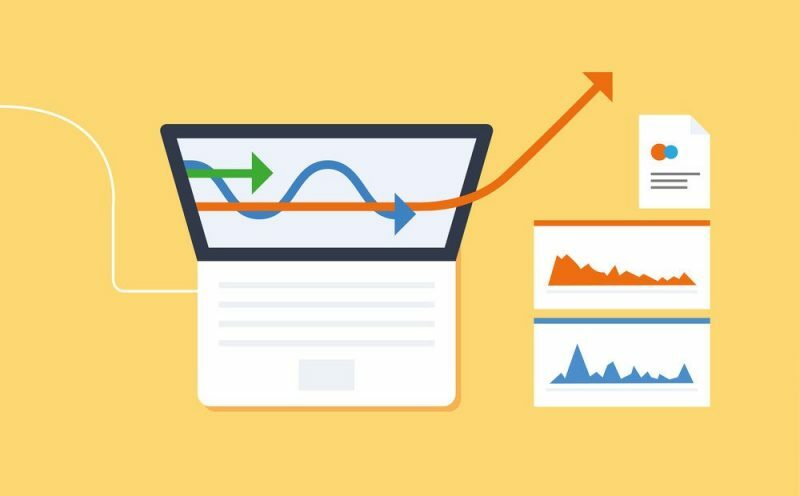 Your total number of visitors will differ from the number of unique visitors, as some people may return to your site several times within a day – especially if they are comparing your product with others. Both metrics are interesting. Unique visitors represent your total reach (the size of your audience), working out why they come back for more will provide you with insights to help drive them (and others) to making a sale. Referrals: Where do visitors come from? Are they searching on Google and finding your company website, are they coming from PPC campaigns, social media, or links on 3rd party websites? If you can see patterns, such as a large percentage coming from Facebook (even when you’re equally as active on Twitter) this information can help you decide how successful your marketing activities are – and where to invest more time or money. Bounce rate: It’s all very well getting lots of visitors to your website, but do they hang around? The bounce rate reflects whether visitors are seeing what they want to see when they hit a page on your site. A high bounce rate suggests that you are either driving them to your site under false pretences (promising more than you deliver), that you’re targeting the wrong prospects, or that the page you’re driving them to doesn’t engage them. Exit pages: When a visitor comes to your site do they read that page and then exit, or do they go somewhere else? Ideally you want prospects to exit on a page that means a sale. If you have an ecommerce site this would be the order page, once they’ve completed their purchase. For other businesses it might be a contact page, after they’ve emailed or called you, or a thank you page after they’ve submitted a form requesting more information or a call back. Conversion rate: How many visitors take the next step when they visit your website? That next step will probably relate to your ideal exit pages – a thank you page after completing a form or online transaction. If you haven’t got a clear customer journey that pushes website visitors to a conversion page, then it’s probably time to put this in place. For those businesses that do not have an online shop, especially B2B companies, a lead gen such as a download (whitepaper, eBook, checklist etc.) is a great way of doing this. I mentioned ‘referrals’ above, and for many companies these will come from social media. For example, a prospect clicking on a link to a blog post from your Facebook page. But as well as measuring the number of clicks to URLs you share on social media, there are other metrics to consider. Page Likes and Follows: If you want to grow your social media following so you can increase your reach and target a wider audience with updates on your social media platforms, you need ‘page likes’ for Facebook and ‘follows’ on other social media channels. This will mean that every time you update your Facebook page, Tweet or share something on LinkedIn, Instagram etc. more prospects and customers will see it. Likes: When one of your followers ‘likes’ an update you’ve shared, it shows that they’re engaged with what you’re saying. It will also increase your reach by showing that update to people your follower is connected to. This can be very beneficial if you wish to reach a particular group of people. For example, people who live a specific location, or work in a particular field, or share other attributes such as age, gender etc. The effectiveness depends on the platform you use, and how targeted your updates are. Shares: Social media updates will get an even bigger boost when someone shares them on their social media feed. If your objectives are to reach a wider audience, and tap into the network of connections your followers have, this metric will help you see how effective your efforts are. Clicks: Of course, clicks to your website are a primary objective for most businesses, whether that’s driving prospects to a landing page to convert them into leads, to a special offer to enable a quick sale, or any other area of your site. The key is to ensure that the URL you share is relevant to your target audience, avoiding the high bounce rate explored earlier. When analysing the success of individual updates you’ll be looking for a combination of ‘reach’ (how many people have seen the post) and ‘engagement’ (are people interested, have they liked, shared, commented on or clicked your link). Once you’ve obtained someone’s email address (such as in return for downloading lead gen content) you have an opportunity to engage with them directly and deliver more targeted and personalised content. You may also have other information about them that can help you market your product or services more effectively – such as their interests, buying history, size of company etc. Open rate: If they don’t open your emails you need to know why. Is it the subject line, are you emailing at the wrong time of day or week, are they just not interested in you and your business? Monitor what does get opened and work out why; are those individuals who do open your emails good prospects? Unsubscribe rate: Have some emails resulted in higher unsubscribe rates than others? Is this a good thing? Sometimes sending a clearly targeted email can help clean up your email lists so that you’re only emailing qualified prospects and leads. However, if this is not your intention, you need to know why recipients are unsubscribing. Time spent reading email: How engaged are your email recipients? Do they scan through your emails and then delete them, or do they spend time reading them? Different emails will be read in different amounts of time. For example, if you’re emailing with an offer you would expect recipients to scan through and click on the offer. If you’re sending a newsletter or announcement readers will take longer, if they’re interested. Clicks through rates: If you’ve included links in your email (and you should) you will want readers to click on them. Typically these represent the ‘next step’ towards becoming a customer, whether that’s sharing a blog post, a special offer or any other CTA. Other links in your emails may be to the company’s social media profiles, or to the website homepage. What are people clicking on, and what happens next? The metrics above provide an overview of what to watch, but the ones that will be most relevant to your business will be those that align with your marketing objectives. If you missed my previous post on offline metrics, read it here.